This chapter explicates The Boo Hoo Bible by Art Kleps, then moves on to discuss narrative fiction. Connecting to earlier discussions of play, it covers Hesse’s Glass Bead Game, Clarke’s Childhood’s End, and the influence of literary imagination on psychedelic aesthetics as Tom Wolfe gestured in The Electric Kool-Aid Acid Tests. It then discusses Kesey’s Sometimes a Great Notion, Burroughs’s Naked Lunch, and hyperconscious approaches to life as a style among groups like the merry pranksters. It shifts to a discussion of religion and mysticism, coming back to Aldous Huxley’s work and the idea of psychedelic or “enchanted” citizenship. 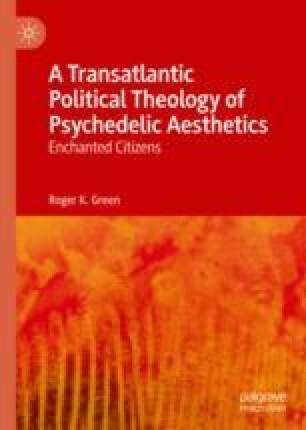 Connecting to recent philosopher’s calls for new “fictions,” it suggests that attention to psychedelic aesthetics opens a possibility to think in terms of metempsychosis or being-beyond-being-toward-death.